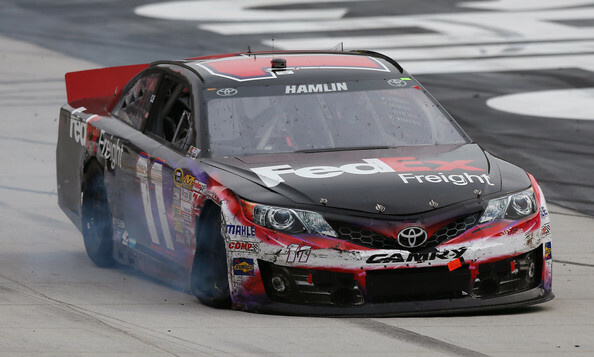 Denny Hamlin had an extremely fast car at Bristol Motor Speedway but unfortunately wasn’t able to come home with the finish he deserved. Early in the race Denny looked very strong and made his way to the lead quickly. Hamlin led a ton of laps and the JGR cars as a whole looked very strong. Denny got shuffled back a little bit and was later battling with the top 3. Joey Logano was in this battle and slid up in front of Denny. Denny lifted once but not twice and bumped Joey who then preceded to spin in the turn. Unfortunately Denny went on to have a RF tire go down late in the race which ultimately caused him to slide back to the 23rd position. Denny did everything he could to hang on and was bouncing off the walls to do so. Watch below to see his eventful day for yourself. Denny slid back two spots in the point standings and is now 6th. Watch next week as Denny heads onto Auto Club Speedway at Fontana.